Everything turns out as I feared it might; i.e. Rutgers falls to Cincinatti and my USF Bulls get roughed up by Louisville. Meanwhile, I'm going to my room to sulk. Update: It now appers that, before the Gators can get a shot at the Buckeyes, not only do they have to beat FSU and Arkansas, but bad things must also happen to both Michigan (getting beaten by Ohio State once wasn't enough) and USC. Time to focus on the Hot Stove League. The Mets are making some interesting moves. Another loss for the dismal science. The year 2006 has seen the passing of two towering figures in economics, one, John Kenneth Galbraith, literally so, the other, Milton Friedman, who died yesterday, having an effect on the discipline far in excess of his height. As they differed in stature, so did their views on most issues. My friend Amity Shlaes has this appreciation of Friedman in today's Sun. Update: In this Slate article, Michael Kinsley says Friedman was wrong, and Galbraith right, about the ability of free capital markets to price correctly publicly traded equity. Update squared: Fray friend Rundeep has an answer for Kinsley. Walking through Battery Park, at the southern tip of Manhattan, this morning, I spotted this bird calmly watching passers-by on the footpath, and evidently unaware of the impending holiday. OK, you don't believe this is a real, live bird? Here it is a minute before the previous shot. 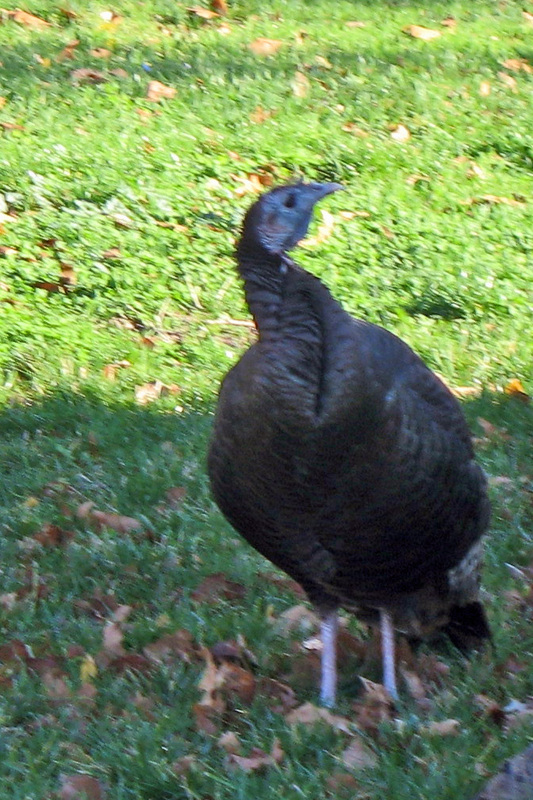 Update: Rundeep points out that wild turkeys are once again common in the eastern states. I know this is true, because whenever we've made a wintertime visit to my in-laws, who moved to Massena, New York a couple of years ago, we've seen a flock of turkeys traversing their back yard, heading next door to where their neighbor puts out food for them. 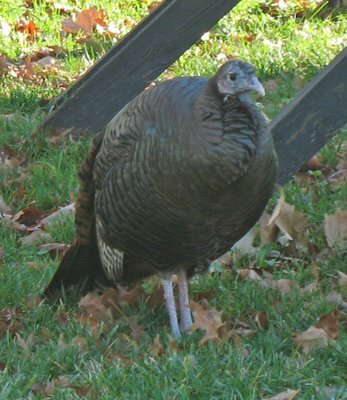 Several things struck me as odd about this bird. First, although it was on a bit of parkland, it was in the most densely urbanized place in North America. Second, it was alone, while wild turkeys are usually seen in flocks. Third, it displayed no wariness of the people walking by on a path only thirty or so feet away. Finally, while it had the coloration of a wild bird rather than the white plumage of most farm-raised ones, it looked very well fed. A couple of years ago, NASA was ready to give up on the Hubble Space Telescope, apparently content to allow it to go dark. Now, there are plans to repair it so it can keep doing what it does so well. Its value has just been made more evident by the images it has captured of supernovae in galaxies so distant that their light has taken half the estimated age of the universe to reach earth. As related in this article, the red-shifting of the light from these supernovae shows that the expansion of the universe has been accelerating over time. This can be explained by positing the existence of a contra-gravitational force called "dark energy". Einstein, in his theoretical work, once concluded that there is such a force, but later called this his "greatest blunder". It appears now that he was right the first time. Here is a Hubble image of a supernova remnant, the Crab Nebula, in our own galaxy. Keifus on a great kick. 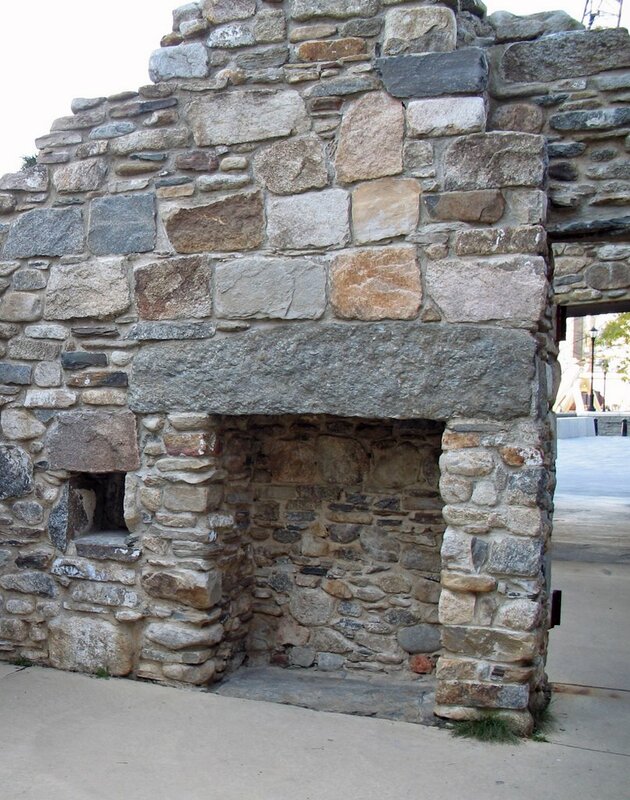 The Irish Hunger Memorial is in Battery Park City, on the west side of lower Manhattan. 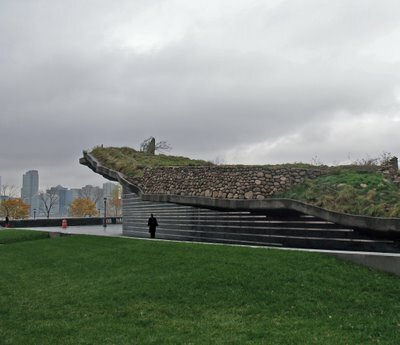 Approaching it from the southeast, one gets the impression of a sod and boulder covered spaceship having crashed to earth there. 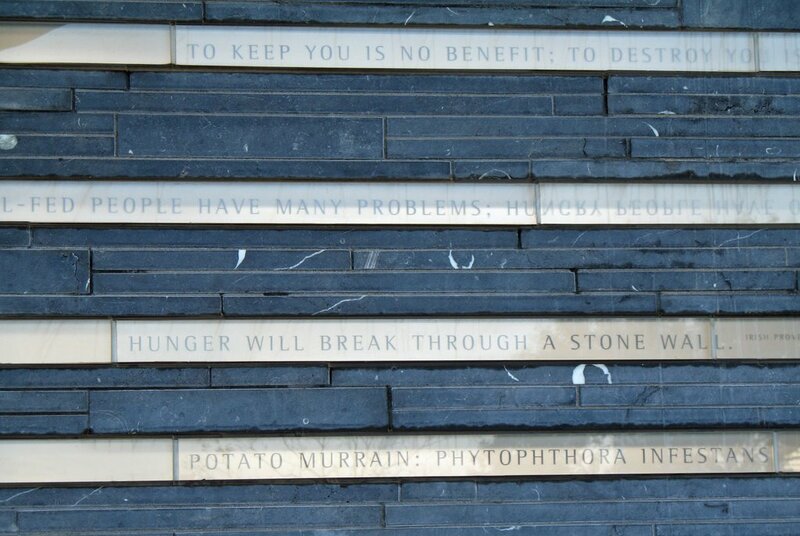 Supporting the slab that holds the stone and earth above are walls of black stone striated with white bands on which are quotations about the Irish famine and other instances of starvation or mass death caused or exacerbated by government policy. 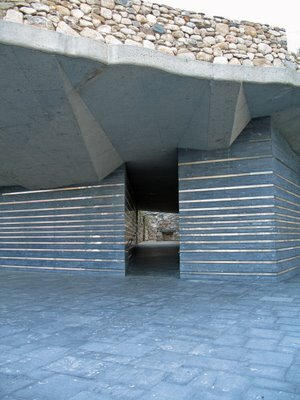 The entrance is through a tunnel lined by the same striated walls bearing more quotations. The effect is supposed to be like entering one of the ancient Irish barrow graves; having visited Newgrange, I can attest to its success. 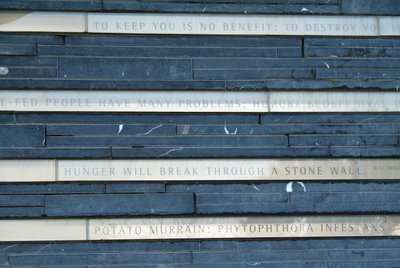 On entering the tunnel, one hears part of a continuous taped program that includes voices reading commentary about the famine, poetry, singers performing ballads a capella and mournful tunes played on keening tin whistle. At the far end of the tunnel, one emerges into the roofless ruin of a typical Irish farmer's cottage of the time of the famine. This is the actual ruin of the Slack family cottage, which was taken apart, shipped to New York and reassembled. 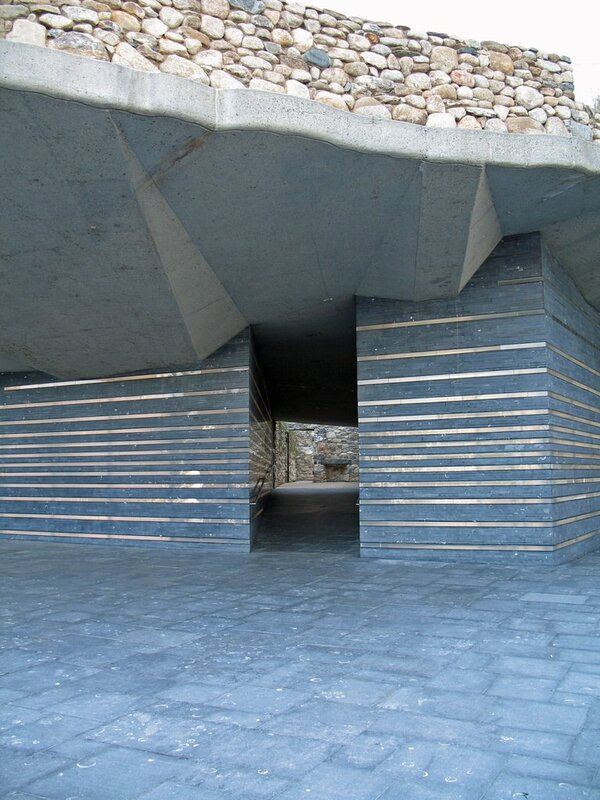 On leaving the cottage, one steps onto a path that follows a reverse "S" shaped course to the top of the Memorial. The ground through which the path wends is covered with plants native to Ireland, grown from seeds brought from there. 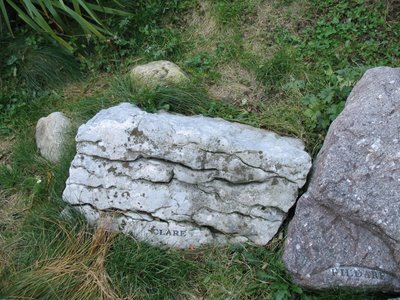 Strewn among the plants are large stones, each inscribed with the name of its county of origin. 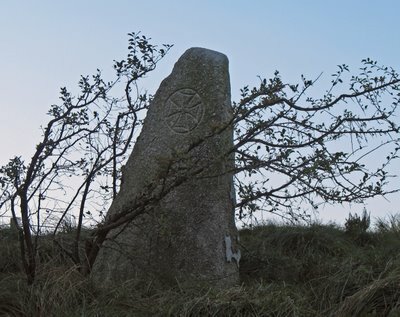 Rounding the first curve of the "S", one comes to face a standing stone engraved with the cross of St. Brendan. 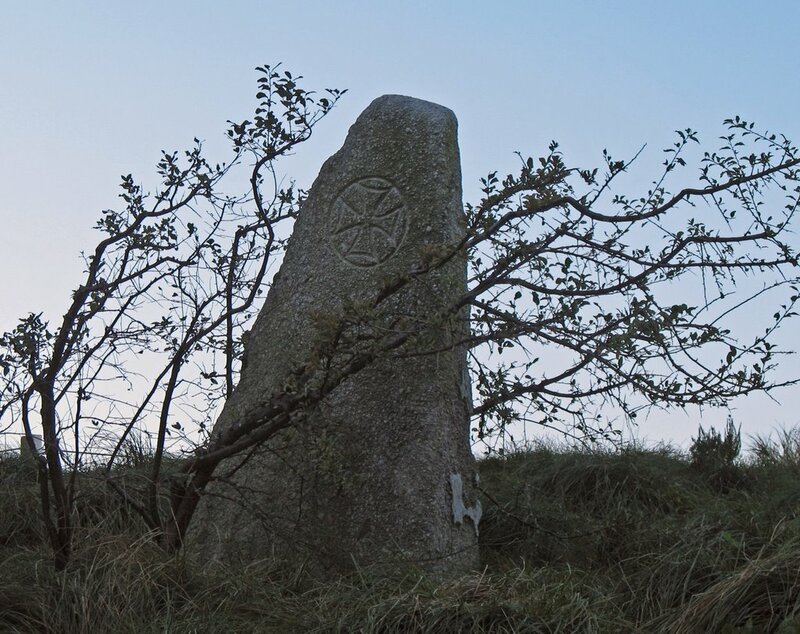 Brendan was a sixth century Irish monk who, according to tradition, set out on a seven year sea voyage with several other monks in a currach, a frail vessel made of oxhide stretched over a framework of sticks. Legend has it that Brendan and his companions reached a distant island, which some now believe to have been in the Canaries and others think was Newfoundland. In 1976, an adventurer named Tim Severin set out from Ireland in a currach built to the same specifications as those made in the sixth century, and did manage to reach Newfoundland in June of 1977. An account of his voyage is here. If Brendan did land in the New World, he was four centuries ahead of Lief Ericsson, and odds on the first European to make the voyage. Perhaps more significantly, he pioneered the route taken centuries later by many thousands of his compatriots, the largest number of which left their native land because of the Great Hunger of the late 1840s, which, through starvation and emigration, reduced Ireland's poplation by one fourth, and which increased the population of New York City by an appreciable amount. Every once in a while I find a blog that's worth special mention, and the latest is The Goat Rope. El Cabrero serves up an irresistable combination: intelligent socio-economic-political commentary accompanied by heartwarming animal pictures. Besides, he's from West Virginia. I'm not, but I was born in central Pennsylvania, not very far away, geographically or metaphysically. Montani semper liberi! Update: It looks like E.C. and I might lock horns on some trade issues (see my comments on "economic nationalism" below), but I still suspect we're in agreement on more things than not.